Peter SPURRIER/Intersport Images Rio de Janeiro. BRAZIL USA W8+. Gold Medalist Bow. Emily REGAN, Kerry SIMMONDS, Amanda POLK, Lauren SCHMETTERLING, Tessa GOBBO, Meghan MUSNICKI, Eleanor LOGAN, Amanda ELMORE, and cox. Katelin SNYDER, at the, 2016 Olympic Rowing Regatta. Lagoa Stadium, Copacabana, Olympic Summer Games Rodrigo de Freitas Lagoon, Lagoa. The junior men also saw an impressive showing from Gonzaga College High School—not only were the winner and second-place finisher, Christian Tabash and Joseph Johnson, Gonzaga athletes, but they both posted scores under 6:02. The youngsters were doing work once again in the men’s open event, with Wisconsin’s Jim Letten taking first place overall with a 5:49.4, as well as in the men’s lightweight event, where Penn’s Jake Ford took the bronze with a solid 6:14. Clearly, 2016 was off to a good start. But it wasn’t all smooth sailing. As it turned out, Winter 2016 was to become a pivotal moment in the season of the lightweight’s discontent: It was then that we saw the first indication that 2016 may have been the final chapter in lightweight rowing at the elite level. Why’s that? As we reported at the time, it was a result of continuing low subscription in the lightweight men’s eight: For the second time in roughly a decade, the lightweight men’s eight saw fewer than seven entries at the world championships for three consecutive years—Rule 36 of the FISA Rule Book states that any event with such low entry numbers over a three-year period is subject to removal from the program. While continued resistance to this change is expected, there is now concern about a broader reaching issue—that of the possible removal lightweight sweep rowing, or even lightweight rowing altogether, at the Olympic Games, as a response to the IOC’s Agenda 2020. It’s a complex issue, as Olympian Will Daly outlined shortly after learning of the potential changes before the Games: “The lightweight four is the most subscribed of the big boats—you’re also getting more ‘developing’ rowing nations in that event, versus any of the heavyweight events.” In Aiguebelette, the lightweight men’s four had no fewer than 24 entries, including crews from Indonesia, Hong Kong, and Uzbekistan. “It provides an avenue for [those nations] to get involved in the big boats. So if you’re going to eliminate an event, I’m not quite sure why they chose the lightweight four, ” Daly said. And after all, we’re talking 2016—the Olympics were at the forefront of our collective consciousness, even as we were ringing in the New Year. Every Olympics has its share of hiccups and anxiety about preparations in the media. But Rio was another story altogether. Poverty, crime, and corruption were among the issues that were expected to cast a pall over the 2016 Summer Games. But none garnered more negative attention than water quality in Lagoa Rodrigo de Freitas. How ironic, then, that rather than the water itself being an issue for the rowers in Rio, it was instead the wind and the rain that colluded to make the water quality less than ideal at times. But as every rowing coach ever is fond of reminding his or her pupils, it’s an outdoor sport. And fortunately for Stone, her years training in choppy conditions on the Charles prepared her well, as the results would show. Stone went on to earn a silver medal, just behind favorite and double medalist at the London Games, Kim Brennan of Australia. One of the most intriguing themes of the Olympic regatta was the generation of perennial contenders taking on new challenges, or continuing to hold their own against a new crop of talented rowers. Look at Katherine Grainger of Great Britain: She won her first medal at the elite level in 1997—a bronze in the women’s eight at the world championships, which happened to be in Aiguebelette that year as well. She raced her first Olympics in Sydney, winning a silver medal in the quadruple sculls, and then took a second silver medal in Athens in the women’s pair. Her third Olympic silver medal came in Beijing, once again in the quad, and then she achieved her ultimate dream of winning the Olympics at what were, for her, a “home Games,” taking gold in the double in London. After London, she had retired—or so she thought. She announced her comeback to elite rowing in late 2014, and it took some time to hit her stride, but hit her stride she did, alongside new double partner Vick Thornley. With her silver in Rio, Katherine Grainger became Great Britain’s most decorated female Olympian across all sports. But perhaps the best example of established elite rowers taking on new challengers came in the men’s single. It was likely the closest-ever finish Olympic rowing—so close, in fact, that were the result to have happened in a different sport, both athletes would have been presented with gold medal. Having battled illness in Beijing but still managing bronze, London could have been Mahé Drysdale’s swan song—the veteran in his third Olympics, coming back and righting the wrongs of his previous Olympic experiences to leave on top. Fortunately for us, that’s not how Drysdale saw the story unfolding. Had he hung up his sculls after London, we might have been robbed of what proved to be the greatest sculling race in Olympic history—a battle between Drysdale and Martin that came down to the line, which they crossed, for all intents and purposes, at exactly the same time. It wasn’t until FISA officials went to the finish-line photo that they were able to determine a verdict. According to the photo evidence at the line, Drysdale had won by approximately two centimeters. That’s a difference of 0.001 percent. Then there were the streaks. There has never been a rowing dynasty at the elite level like the Kiwi Pair. Their track record after the Rio Games, just as it was before the Olympics, remains unblemished. While the athletes have changed over the years (indeed, the program is almost as remarkable for its depth as it is for its penchant for winning races), the women’s eight from Team USA has been undefeated since winning the 2006 world championships. That’s more than a decade of dominating one of the marquee events in our sport. The 2016 Paralympic Regatta was a memorable one for the U.S. and Canada. Both the U.S. crew and the Canadians were chasing the British LTA mixed coxed four all the way down the course, with the U.S. even going out to an early lead after the first 250 meters. While ultimately the Brits showed their class—after all, they entered competition as the defending Paralympic champions in this event, and dominated the medals table with three golds and a bronze—the U.S. held on with the Canadians just behind them. When all was said and done, the U.S. crew of Jaclyn Smith, Dorian Weber, Zachary Burns, Danielle Hansen, and coxswain Jennifer Sichel posted a 3:19.61, less than two seconds back of Great Britain, and just 0.29 of a second ahead of Canada. It also marked the first time in Paralympic rowing that all three medalists in this event had broken 3:20. This year in rowing also marked the first time that FISA has held three levels of world championship racing in one place, at the same time. Appropriately dubbed Mega-Worlds, the event went off without a hitch (though the weather didn’t always cooperate), and, as the nickname suggests, this regatta had it all: A host of the world’s top talent, agonizingly close finishes (though not that close, in light of Rio), and a new crop of champions. And while it was in some ways a season to forget for the USRowing under-23 men, their junior counterparts excelled alongside the ever-dominant U.S. women’s national team. In all, the U.S. juniors brought home six medals. These included gold in the women’s double sculls (Emily Delleman and Caroline Sharis), silver in the men’s eight (coxswain Jacob Shusko, Charles Turina, Nikita Lilichenko, Cole Ortiz, Ethan Seder, Drew Taylor, Trey Holterman, and Michael Cuellar) and bronze in the men’s quad (Clark Dean, Zachary Skypeck, Andrew LeRoux, and David Orner), coxed four (coxswain Ethan Ruiz, Harrison Burke, Kyle Fram, Pieter Quinton, and Kenneth Coplan), and women’s four (India Robinson, Kelsey McGinley, Sarah Ondak, and Abigail Tarquinio. For the U.S. junior men, it was the best showing in the history of the program in terms of overall placing (stepping up from another record year last season in Rio), and they accounted for three medals and a fourth-place finish in Rotterdam. At the under-23 level, the U.S. women showed that there’s reason to expect that the senior national team’s run of Olympic success is far from over. Coached by Wesley Ng, the U.S. under-23 women’s eight (coxswain Sydney Edwards, Sarah Commesso, Lindsay Noah, Julia Cornacchia, Grace McGinley, Katherine Burns, Sophia Lynn, Jilian Renley, and Katryna Niva) ran away with the title. It’s not often you see a crew win the eight by seven seconds at the elite level. While there was much to get excited about throughout the spring and summer months, this year’s fall racing hasn’t disappointed either. As usual, the Head of the Charles led the way. Without a doubt, one of the most fun (and fan-friendly) traditions in rowing is the “Great Eight.” This year at the Charles, we were blessed with not two, but four Great Eights, with elite scullers and sweepers taking up oars against one another for bragging rights in Boston. But things didn’t quite go down like you’d expect. On the men’s side, there was no shortage of Olympic legends on board the West End crew, including now double Olympic champion Mahé Drysdale, Norwegian legend Olaf Tufte, the oh-so-close-to-golden Damir Martin, British Olympic medalist Alan Campbell, and Rob Gibson of Canada. 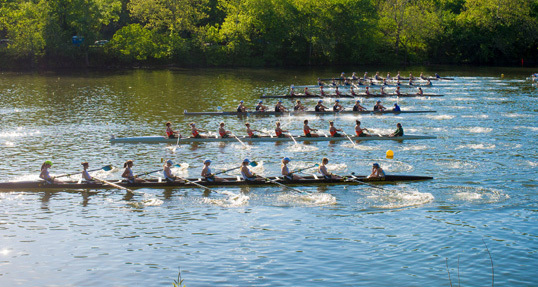 Still, though, between the time spent together training, and the talent that makes up the roster of many of the top U.S. collegiate programs, West End found themselves battling to stay in the top 10—Washington came through with the victory in the men’s championship eight, followed closely by Cal, Harvard, and Yale. In fact, West End finished seventh, between two Princeton crews (another indication of the Tigers’ program depth). Meanwhile, Leander Club (not officially a “Great Eight,” but made up of British Olympians—including 2016 gold medalist Moe Sbihi—from a number of different clubs) came in 13th overall—not the result that they were expecting. The women’s championship eight was a different story. Not only did Gevvie Stone pull off the double victory once again, winning both the champ single and the champ eight in one weekend, she stroked the Cambridge Boat Club crew that boasted Kim Brennan, Emma Twigg, Carling Zeeman, Magdalena Lobnig, and Sanita Puspure to a win over the elite sweepers representing New York Athletic Club by roughly 15 seconds. Still the NYAC crew, stroked by U.S. Olympian Grace Luczak, took second place ahead of Yale, with Brown, Michigan, and Virginia rounding out the top five. Stone and Brennan didn’t have long to celebrate their joint victory, however, before it was time to go head to head in Philadelphia for the Gold Cup, an event that also featured a rematch between Drysdale and Martin, this time over 750 meters on the Schuylkill River. And while Brennan defended her Olympic gold in style, edging the field by roughly two seconds, this time it was Martin who got the last laugh, to the tune of $10,000 and the title of Gold Cup champion. Now winter is upon us again—it’s time to go to work, and lay the foundation for another outstanding season over the short course. As of right now, we have indications of who might be the top contenders this spring, but there are many unknowns, and many meters to row before we find out any answers. The same goes for the Tokyo Olympics, as negotiations about course location are ongoing at time of writing and FISA continues to build a rowing program that will both uphold the traditions of the sport and fit the IOC’s evolving vision. As one dramatic quadrennial comes to a close, we’re on the threshold of another that could become the most significant in the history of our sport in the Olympic movement.